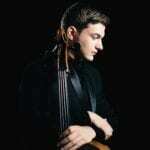 Askonas Holt is thrilled to welcome Romanian cellist Andrei Ioniță to our instrumentalist roster for general management. Described by The Times as “one of the most exciting cellists to have emerged for a decade”, Andrei won First Prize at the International Tchaikovsky Competition in 2015, and prizes at the ARD, Feuermann and Khachaturian competitions. In 2016 he was named a BBC New Generation Artist. He has already performed with the Mariinsky Orchestra and Münchner Philharmoniker (both with Valeriy Gergiev), Deutsches Symphonie-Orchester Berlin (Nicholas Collon), BBC Philharmonic (Yan Pascal Tortelier), Tokyo Philharmonic Orchestra (Mikhail Pletnev) and Czech Philharmonic; and given recitals at the Kissinger Sommer, Mecklenburg-Vorpommern and Schleswig-Holstein festivals. Forthcoming dates include concerts with the San Diego Symphony, MDR Sinfonieorchester and The Hallé; as well as recitals at Konzerthaus Berlin and Carnegie Hall. He will make his Wigmore Hall recital debut next week, on Monday 27 November. Andrei will be managed at Askonas Holt by Antonio Orlando and Niall Houlihan.